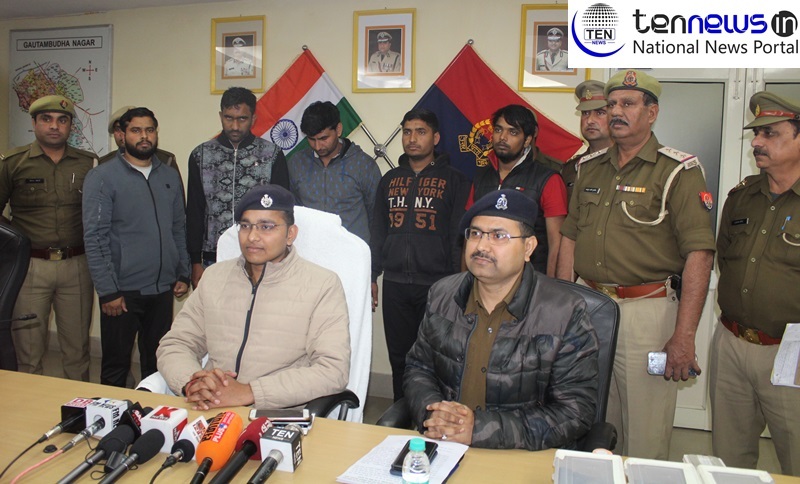 Greater Noida (04/02/2019) : Noida police arrest five criminals after an exchange of fire, who are allegedly involved in shooting a security guard deployed at Oppo Company in Greater Noida’s Ecotech 1 area. Police arrested all the accused over a tip of police informer from Lukas corner near Oppo company around 2:10 in midnight on February 4th. Police had recovered the two pistols, one country-made gun, live cartridges and a Kwid car in which the assailants were commuting during the time of the encounter. On 31st January four car-borne assailants had shot Dinesh Kumar (38) security guard deployed at Oppo Company and fled from the spot. In the incident, the victim sustained injuries in the abdomen and was taken to Kailash Hospital. On the day of incident police also had recovered a Santro car which the assailants had abandoned after the rammed the car beside the road and fled from the spot. Further SP told that “the prime objective of this attack was to get a contract in the Oppo Company and great the dominance among their rivals.” For now, a total of six people were absconding in the incident and for their arrest, police teams are conducting raids.